มอบทุนรักษาพยาบาลให้เด็กหญิงพรินพร จรสมาน ที่โรงพยาบาลเด็ก - TISCO Foundation has made recently is to Parinporn. Another medical care grant TISCO Foundation has made recently is to Parinporn, 1 year old. Parinporn has mental and physical disabilities, receiving medical treatment at the Children's Hospital. 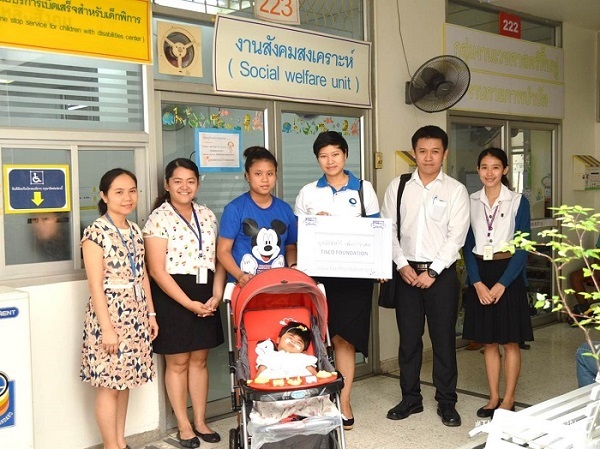 The grant includes a medium-size child trolley at THB 2,550 value. 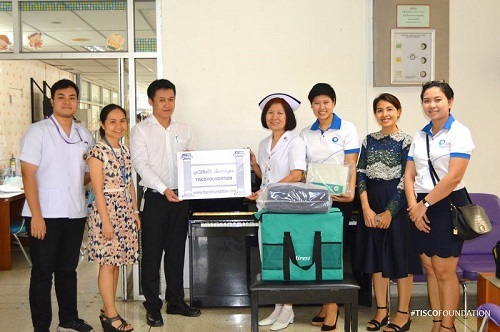 มอบทุนรักษาพยาบาลให้แก่ ด.ช.วรากร ที่โรงพยาบาลเด็ก - TISCO Foundation has donated a medical care grant to Warakorn Khunlee. ช่วงที่ผ่านมามูลนิธิทิสโก้ได้มอบทุนรักษาพยาบาลให้แก่เด็กชายวรากร อายุ 10 ปี ที่โรงพยาบาลเด็ก เป็นที่นอนลมแบบลูกระนาด มูลค่า 7,760 บาท วรากรเป็นผู้ป่วยอัมพาต มีแผลกดทับในบริเวณร่างกายและขา แพทย์แนะนำให้ใช้ที่นอนลมแบบลูกระนาดเพื่อป้องกันแผลกดทับ. TISCO Foundation has donated a medical care grant to Warakorn khunlee, 10 years old, at the Children's Hospital. The grant includes an electric ait mattress, THB 7,760 in value. 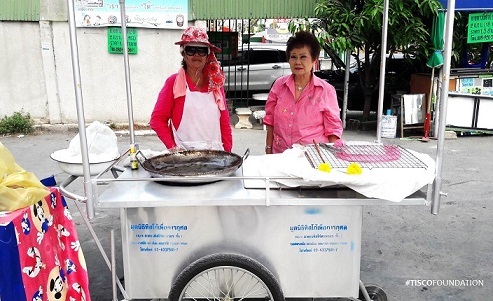 Warakorn has paralysis which results in many bedsores on her body. He medical doctor suggests using an air mattress to reduce such risks of having more bedsores. มอบทุนประกอบอาชีพนางสุภาพ ธนะศรีสืบวงศ์ - TISCO Foundation has donated a start-up grant to Suparb Tanasriseubwong . TISCO Foundation has donated a start-up grant to Suparb Tanasriseubwong to support her fried noodles (pa tong go) business. Suparb has been making and selling pa tong go for about 10 years. The grant includes a vending trolley and a gas stove. มอบทุนรักษาพยาบาลให้กับเด็กหญิงชรินรัตน์ สมอหอม ที่โรงพยาบาลลาดกระบังกรุงเทพมหานคร - TISCO Foundation is donating an oxygen generator , to Sharinrat Samohorm at Latkrabang Hospital. 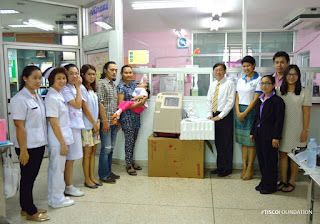 Today TISCO Foundation is donating an oxygen generator, THB 24,500, to Sharinrat Samohorm at Latkrabang Hospital. 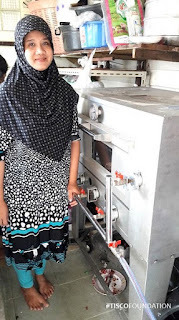 Sharinrat is mentally disabled and has chronic lung disease which requires the oxygen generator to help her breathe. This will allow her to go back home with her parents. Many thanks to Khun Pornchanok Keawking, Social Worker of Latkrabang Hospoital, for this kind coordination.